Cama, Shernaz (ed.). 2016. 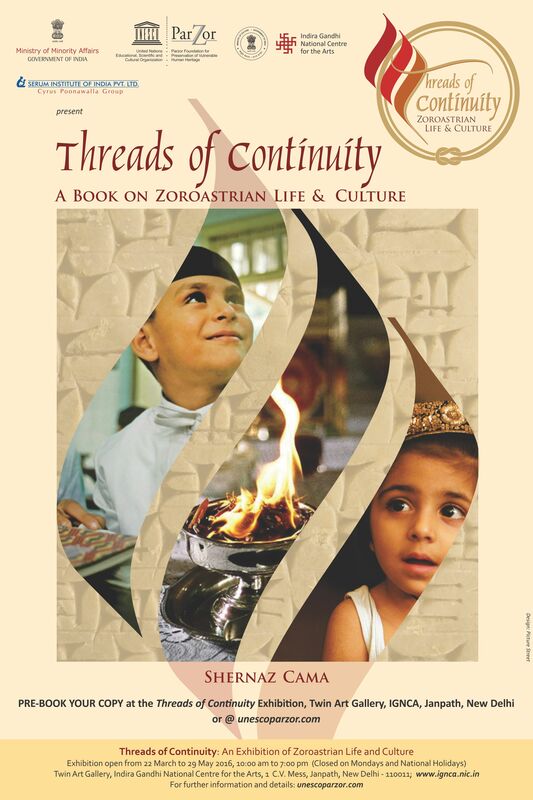 Threads of continuity: Zoroastrian life & culture. New Delhi: Parzor Foundation. Threads of Continuity Focuses on the philosophy and cultur of the ancient Zoroastrian faith from its origins i Central Asia, tracing a geographical and chronological continum till the present. This philosophy became a part of the lived heritage of the Zoroastrian community — both in India and Iran. Of dpecial interest are the cross-cultural influences of the comunity in India. To highlight these, Gujarat and the Deccan will be examined in detail for the first time. A part of this compendium also studies the contribution of the community to the making of modern India. The programme envisaged, attempts to explain the Zoroastrian philodophy of a sacred thread linking all creation. Shernaz Cama is an Associate Prfssor of English at Lady Shri Ram College University of Delhi and the director of the UNESCO Parzor Project for the Preservation and Promotion of Parsi Zoroastrian Culture and Heritage.